Do... I like the book trailer? : YES. I rarely watch book trailers, I'll be honest, but this one feels like a very good movie trailer -- it really captures the mood of the book! Buy, Borrow, or Avoid? : Borrow if you're into Vikings, early medieval fiction, and banter-y band of brothers type war fic. Why did I get this book? : I do love me some Vikings. Review: I will admit upfront that books with a heavy bent toward violence, war, and brotherhood of men aren't really my thing. 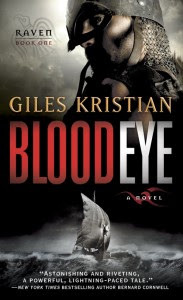 But now and then, I get a hankering for some 'guy' fiction -- like Clive Cussler or Mickey Spillane -- because I want an action movie type of read, and in this case, Blood Eye was a perfect summer flick of a book. In 9th century England, Osric is apprenticed to a mute carpenter, the only man in a small seaside village willing to take him in when he was found two years earlier. Unable to remember his past, Osric is marked with one permanently bloodshot eye, and is feared by the village. When Norsemen land nearby, Osric is shocked to discover he speaks the strangers' tongue and he becomes a translator -- and betrayer -- of his village. When the worst happens, he's pressed into service on the longship and from there comes his transformation from Osric to Raven, a Norse warrior. Kristian's writing style is easy and readable -- peppered with historical details (and crazy Norse and medieval-y English names) -- and the story is pretty dramatic. At times, I was acutely aware this was a 400+ page book -- I think it could have used a little trimming -- but the story always picked up. Personally, I had a hard time reconciling liking the characters with their bloody behavior, even if historically accurate, which might have been the biggest hang up for me with this book. But Kristian creates a kind of black humor banter-y connection between his characters that invites like, even affection. On a format note, I have to give Bantam props for a lovely e-book. The formatting was wonderful -- the 'small' font was nice and readable -- and the table of contents was detailed and hyperlinked. This book is the first in a trilogy, so those who like chunksters you can dig into, you'll be in for a treat. I'm thrilled to offer a copy of Blood Eye to one lucky reader! To enter, fill out this brief form. Open to US/Canadian readers, ends 9/14. Argh, trilogies! I just want the tale told in one book sometimes! However, sounds like a pretty fascinating tale and like you, I have a hankering for some guy fiction every now and again. I hear ya! In this case, this book ends very neatly and can be a standalone -- although I will say, I'm not opposed to learning more about Raven's life as that era is one I find fascinating. This is a great 'guy' fic to pick up when you're in the mood -- it would make a gory-but-popcorn-fun film, too! I didn't know the Vikings made it to Byzantium -- that blows my mind! I might need to tune in for those adventures -- because that sounds very fun. Thank you for stopping by and commenting -- I appreciate it! I've been a bit hesitant to start this series - I have all three ARCs but I tried the first chapter of this one and I wasn't too impressed. I have a feeling we are going to end up feeling mostly the same way - I feel more like I have to read it than I want to read it. And you're right -- that book trailer is a pretty good one. I usually don't watch any, but this one does a good job of reigniting my interest. My dad has always tried to get me into Clive Cussler and I always resisted. I'm biased based on the awful covers on the ones he reads. Any recs on a good one to try? I started reading Cussler in high school and I'll be honest -- it's a bit misogynist, and homophobic, and cheesy but oh, I have a soft spot for Dirk Pitt. I couldn't tell you which book to start with -- maybe read them in order -- altho to be honest, Cussler wasn't great with continuity -- Dirk's father's name changed between books, his lover's eye color changed between books, etc. Still, trashy fun. This is meatier than Cussler's novel -- certainly the research is! -- but it has that brash, brazen, brawler feel to it that feels very 'guy-ish' -- not to be making sexist pronouncements about fiction, but you know what I mean. I like books that can take me to dark and tumultuous times and that feature action packed drama, so it seems like this might be a really good read for me. I haven't read a lot of fiction about Vikings, but what I know of them really interests me. Great review today, Audra, and thanks for letting me have a chance at the great giveaway! Heather -- this one is very dark but with that undercurrent of black humor that comes with a collective of folks who have seen hell, so to speak. Kristian's book felt pretty historical, if that makes sense -- I didn't feel like there were anachronisms in terms of behavior or dialogue -- and there's a great author's note at the end detailing what was historical etc. Always my fav part of a novel. this book is not my cup of tea, but I'm glad you enjoyed it.